Blackheads, whiteheads and pimples are not a fun subject to discuss. Unfortunately, whether you are a man or woman, adult or teen we all have these issues. Conventional wisdom tells you not to touch these on your face. However, there are those times when you have to get rid of the blemish or blackhead. Using your fingers is a no no. Luckily there are tools for these types of problems. I was given the opportunity to try out Majestic Bombay - Blackhead Blemish Remover Clear Tool Acne Pimple Extractors. What is it exactly? 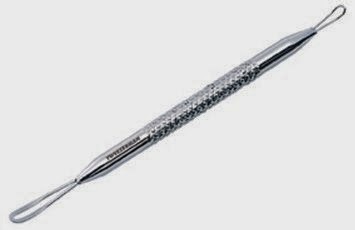 It's a stainless steel wand with a thin, angled loop to get rid of whiteheads and a flat side to press out blackheads and pimples. Using this product minimizes chances of bruising since you are not using your fingers. It's very easy to control since it has a no slip grip. All you need is gentle pressure and you can clear out your whitehead, blackhead or pimple in seconds. It's a handy little product to have around and I highly recommend this.